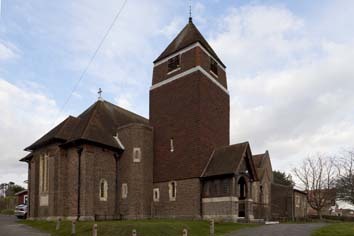 It was decided in 1924 to build a new church for the expanding eastern area of Bexhill and work was undertaken in 1929-30, though final consecration did not follow until 1933 and the church did not become fully parochial until 1990. It is built mostly of brownish brick and in simplified gothic and was designed by J B Mendham at a cost of £7000 (CDG 18 p341). Only a south aisle was built with transverse gables, though a blocked arcade inside shows that a north aisle was intended as well. The exterior with its hipped roofs and windows with uncusped lights is recognisably of its time, especially the plain but substantial tower. This has no period detail beyond the timbered porch at its base and is surmounted by a pyramid spire. Its sides were tile-hung in the 1960s to protect them from erosion by the salt-laden air. The proportions of the interior are low since the nave has no clerestory and the effect is accentuated by the broadly proportioned arcade of the south arcade and the almost round-headed chancel arch. The detail is closer to C13 work. 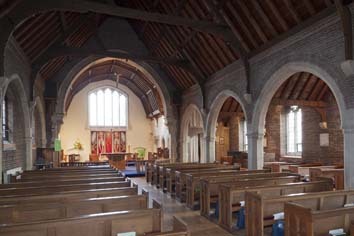 The nave roof has tiebeams on wall-posts and that of the chancel is panelled. Font: Square of 1930, with dogtooth decoration on each corner and a carved cross on one side. 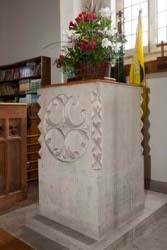 It commemorates a soldier killed in World War I, whose family donated it as the church did not have one. Glass: (East window) M Cantrell, 2003 (Church website). The symbolic design centres on the Holy Spirit, which provides the only element of colour, a splash of red in the otherwise monochrome colouring. 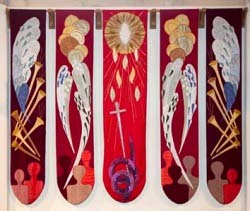 Hanging: (In place of reredos) 1997, with long thin panels embroidered with symbols by M Cantrell (ibid). The colours become more intense from the sides, culminating in the bright red of the centre one and the whole composition contrasts intentionally with the same artist’s later glass above. My thanks to Nick Wiseman, both for the photographs and for providing me with much valuable information about the church, derived largely from its guidebook.